WONDERS OF THE SEA takes viewers on a trip under the ocean, capturing incredible footage of rarely seen sea creatures, while warning about the impacts of climate change. 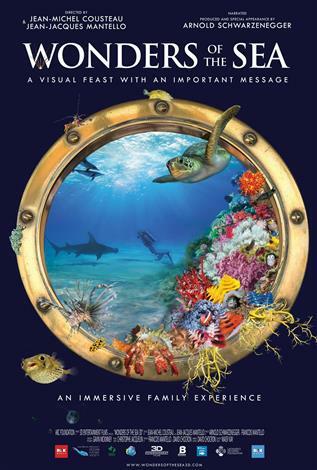 From Fiji to the Bahamas, Jean Michel Cousteau and his children Celine and Fabien embark on a voyage to discover the ocean as never before seen, and learn more about the threats that put our ocean at risk. Narrated by renowned environmentalist Arnold Schwarzenegger, the film is absolutely stunning, with awe-inspiring scenery. It makes it feel like you’re diving alongside the Cousteau family, close to the creatures but without getting wet! These rarely-seen multicolored creatures performing in an exceptionally vibrant underwater world will fascinate, educate and entertain the whole family. WONDERS OF THE SEA is a once-in-a-lifetime experience and a declaration of love to the ocean.